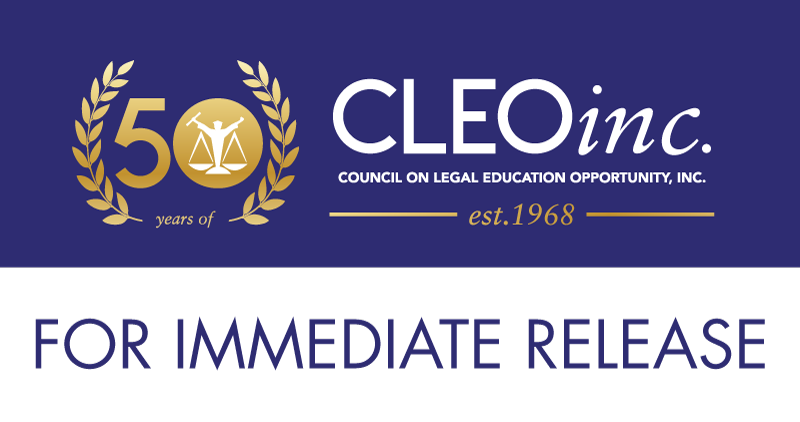 Largo, MD – August 3, 2018 – The Council on Legal Education Opportunity, Inc. (CLEO) is pleased to announce the winners of the inaugural CLEO EDGE Award in Education. CLEO, widely renowned for its mission to increase the number of lawyers from diverse backgrounds, created these recognition awards to promote its focus on the three pillars or characteristics which undergird the organization’s purpose and in recognition of its 50th anniversary. Those pillars are Education, Diversity, and Greater Equality. “The CLEO EDGE Awards are a way of acknowledging and celebrating the achievements of individuals, law schools, and organizations that have impacted legal education, the legal profession, and society in general. These honorees have made notable contributions to education, their communities, and the nation,” said Cassandra Sneed Ogden, Chief Executive Officer, of CLEO. Fifty (50) honorees have been chosen from more than 200 prominent nominees for their accomplishments. “We believe these 50 leaders will continue to have an impact on legal education and especially on aspiring lawyers poised to become our future leaders. Our motto ‘Training Tomorrow’s Lawyers, Preparing Tomorrow’s Leaders’ is apropos for this category,” Sneed Ogden added. On Thursday, November 15, 2018, CLEO will host an Awards Gala at the Ritz Carlton in Washington, DC, to honor these winners, along with winners in the categories of Diversity and Greater Equality. Based on the theme “The CLEO EDGE: 50 Years of Championing Education,Diversity, and Greater Equality,” the gala will also feature the inaugural CLEO EDGE Heritage Award which will be given to Vernon E. Jordan, Jr. in recognition of his more than 50 years of service to the legal profession and the embodiment of all three categories.